HIKING THE ZION NARROWS: Overview of Routes, Permits, etc. The North Fork of the Virgin River (aka "The Zion Narrows") is probably one of the most legendary canyons to hike in all of Zion National Park. The Zion Narrows is the section of the Virgin River just upstream from the Temple of Sinawava (the end of the road up the main canyon). Here, the majestic walls of the main canyon close in to form a tall and narrow canyon with beautiful dark corners and the Virgin River flowing around you. With beautiful flowing water and barely any direct sunlight reaching the bottom, this is the slot canyon that all other slot canyons are compared to. 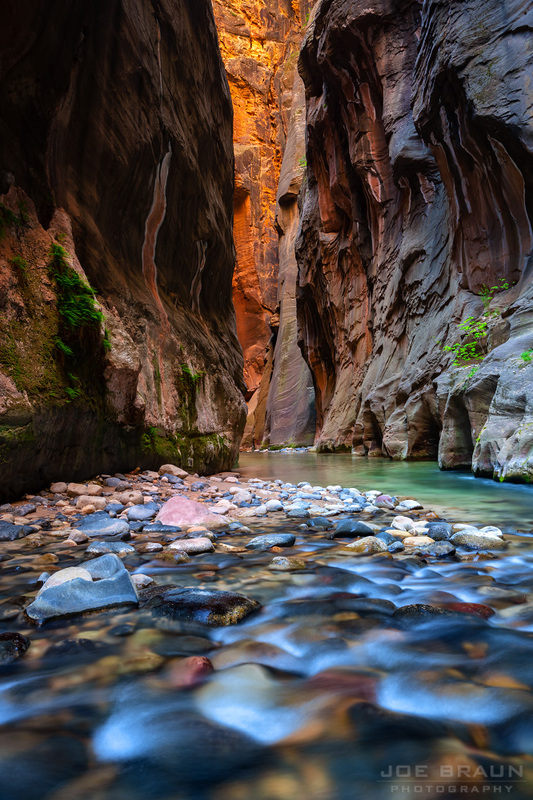 For tourists or casual hikers who want to see the best of the Zion Narrows, this is the hike that you want to do! Starting at the Temple of Sinawava (the last stop on the free Zion Canyon shuttle), you can hike up the Riverside Walk trail and then continue hiking right up the river to see some of the best "narrows" sections of the North Fork of the Virgin River. Hike up as far as you want to go and then turn around and retrace your steps. A side hike up Orderville Canyon is also a good detour to see even more amazing slot canyon scenery. As a round-trip hike, this can be as leisurely or strenuous as you wish to make it. A wilderness permit is NOT required for this hike. 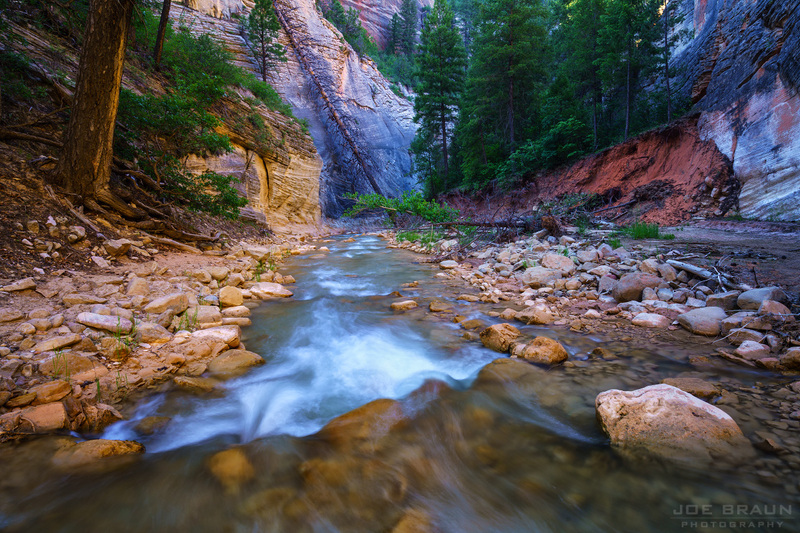 The "Top Down" Zion Narrows hike is a strenuous 16-mile through hike that starts at Chamberlain's Ranch, many miles northeast of Zion's popular main canyon. (You must drive to or hire a private outfitter to shuttle you to the remote trailhead.) This route takes you through the more subtle scenery of the upper plateau as you follow the North Fork as it slowly transforms from an open stream into the majestic and deep slot canyon that opens into Zion Canyon. A wilderness permit is required for this route and you choose one of the beautiful designated campsites when you purchase your permit at the Visitor Center. If you are a fast and strong hiker, the "top down" Narrows hike can be completed in one day. This hike may take roughly 12-14 hours to complete, so be sure to start early and keep a good pace! Bring a headlamp just in case you have to hike the last stretch after dark. A wilderness permit is required for the top-down day hike. 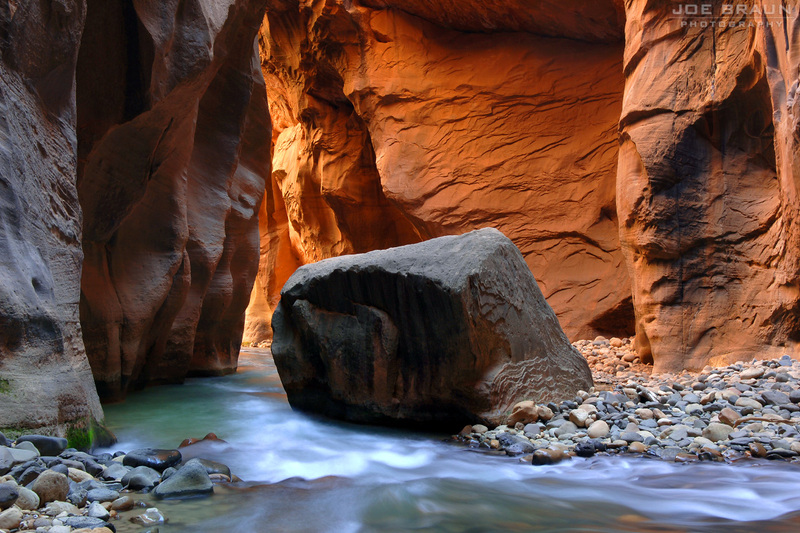 You do not need a permit to do the Zion Narrows "bottom up" day hike from the Temple of Sinawava. You DO, however, need a Zion permit for all "top-down" hikes, even if you are hiking down in one day. If you are doing the backpacking option, you pick your campsite when you reserve or purchase the permit for your group and you must camp at your designated campsite. Please do not squat at any campsite that you don't have a permit for; rangers do patrol and ask to see permits. Note: The National Park Service will not issue any Narrows permits if water levels are too high, either because of flash floods or high flow during the spring runoff. During the winter months, permits for the one-day top-down hike are also not issued as there is not enough daylight to complete the hike safely. Please see the Zion Wilderness Permits website for more information. Beyond what you would take on any other hike (food, water, map, etc. ), below is a list of some of the essential equipment you will need for any of the Zion Narrows hiking routes. If you don't have your own equipment, many of the outfitters in Springdale sell or rent equipment. Footwear: Since you will be hiking in knee-deep water almost all of the time, strong water-friendly footwear with toe protection is a must. Some of the stronger models of Keen sandals are okay, but even better are any trail runners that do *not* have GORE-TEX, so they can breathe and drain. (A shoe like the La Sportiva Akyra Trail Running Shoe works great; they offer good foot protection, good grip, drain and dry quickly, and are good for dry hikes as well.) Also popular are the Adidas Hydro Lace Canyoneering Shoes, although they are a bit expensive and bulky. And a good pair of neoprene socks will be much better than cotton to keep your feet warm and blister-free. Footwear to avoid: light sandals or water shoes like Tevas. They will likely break before the end of the day and if your toes are exposed, your toes will get smashed in the rocks. Also avoid big heavy hiking boots; while they will protect your feet, they will feel very heavy and most boots take too long to dry out and will get a bad case of the stinks. Drybag: Very useful to stow your wallet, camera, and other items that don't like to get wet. While most of the Narrows hike is knee to waist deep, there are a few chest-deep sections and very occasionally you may get seasonal swimming sections. Clothing: Any clothing that doesn't mind getting wet. While quick-drying/moisture-wicking material is the best, it is also a bit too pricey for my wallet, but neoprene socks are a good (and not too expensive) alternative to cotton socks. A fleece would be a great to keep you warm as direct sunlight is sparse. If you are hiking in the cold off-season (October through April), a wetsuit or even a drysuit would be beneficial, especially when water temperatures are in the 30s and 40s (Fahrenheit). Backpacking Gear: If you are doing the top-down backpacking route, standard overnight gear is in order -- sleeping bag, small tent, small portable stove and drybags to stow this gear in. (Nothing is worse than a wet sleeping bag.) Note: No campfires are allowed in the Zion backcountry. To save space, many hikers forgo the luxury of the tent, but I can't bring myself to do this. Headlamp: This little piece of gear will be invaluable if you get stuck in the Narrows after dark. Without a headlamp, you don't have any chance of hiking out of the Narrows after final light. Bring one, especially if you are attempting the top-down route in a day. Two current lightweight models that I like are the Petzl Actik (dual LEDs with settings up to 300 lumens) and the Black Diamond Cosmo 225 (dual buttons to turn on/off without having to cycle through different modes and IPX8 waterproof rating). Even more useful items can be found on the Hiking and Backpacking Gear page. Please see the Zion Narrows "Bottom-Up" Day Hike and Zion Narrows "Top-Down" Route descriptions for more specific route information!